Now that the two playfield halves were stripped of parts, I wanted to take a note of the initial issues I was facing with the restoration. I expect more issues will come to light as I progress, but wanted to document the starting point to help gauge how the restoration progresses. This update will look at the lower playfield area. The mylar was lifting in a number of places on the lower playfield, most notably around the inserts. There is also a darkening / fading of the artwork not covered by the mylar. Having given the playfield a look over and making a few notes on things that will require attention, I decided to start working on it. The first thing I wanted to do was get the playfield stripped down. 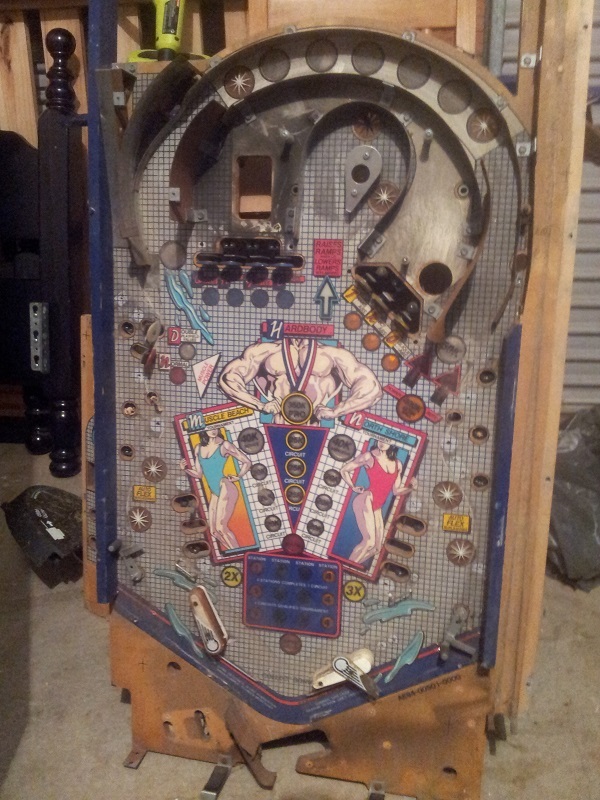 The small upper section of playfield was already stripped (both top and bottom sides). The lower section (large area) had lots of parts to remove. So it’s no secret I love pinball. Not just the playing of these wonderful beasts, but (..and arguably more so) the learning about their inner workings and how to give them back their former glory. Like an overexcited apprentice, I want to understand everything right now and be able to do anything the veterans can. Thankfully I able to keep a level head (mostly :)) and respect the fact I’m still new in this area and enjoy the journey. 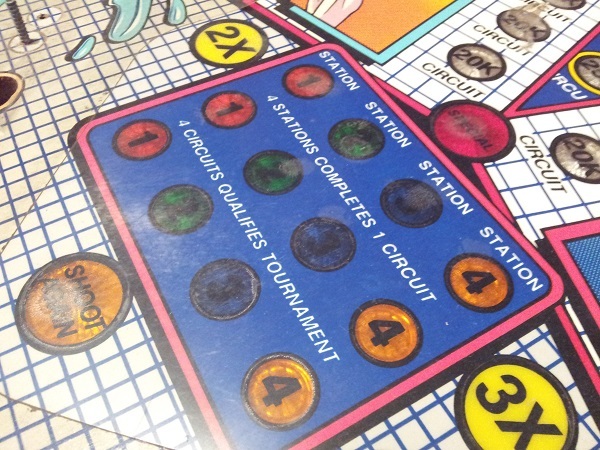 On my current pinball project (Fireball Classic), I had to do some minor playfield touch ups. Thankfully it was quite straight forward. But I was terrified given any mistakes could be hard to back peddle from. I also know what I did do could be done better – given experience. I wanted to get some more experience with playfield touch up and restoration and decided this could make an interesting side project to work on. If I could find some damaged playfields which could be written off in the worst scenario, then this would make a great learning exercise and benefit future playfield restoration work (like my Nugent for example). Recently I acquired a playfield from “Hardbody”, a Solid State game from Bally in 1987. A bodybuilding theme – I found it amusing there was a pinball theme based on bodybuilding. Even at the height of my gym training a few years back (where I was training 5 – 6 days week) I think I would have been embarrassed to play this 😉 But anyway, it ticked all the boxes. The Fireball Classic has some pretty neat side art. The one down side to it is it fades. Every Fireball machine I’ve see has suffered the same fate (to varying degrees). On mine, the yellow fire is white and the orange fire is yellow. The red and blue have held up better, but have certainly seen better days. The side art is actually printed on decals, which is the primary reason for the colour fade. There are two options available to me – replace the decals or use stencils and paint. I explored the painting option first but backed away from that option. There are stencils available for the original Fireball machine, but none for the Classic. I could make my own, but it would be quite time consuming to get it right and I don’t believe it would provide an accurate high quality finish like the original. That left decals. I did some searching but could not locate any for sale. Luckily I had a contact who is an artist and was up for reproducing the fireball decals. With his help, the head box and cabinet body decals have been reproduced. We went through a few revisions as some issues were ironed out, but it’s come up looking pretty good.